Special foster parents is a member of society either individuals, communities, organizations, or corporation who make a donation through GNOTA with special request of specific school, class, province, ethnic, etc. to receive their donation. Sum of 100 foster child is the minimal amount of donation required for special foster parents donation. For further information. Contact us. Continuous foster parents is a member of society either individuals, communities, organizations, or corporation who continually make donation through GNOTA in order to ensure their foster child attend to school and graduate. Foster parents can make a donation according to donation package of 3 and 6 school year for elementary school, or package of 3 school year for junior high. For further information. Contact us. Foster parents is individuals who voluntarily make a donation to a less fortunate family in order to ensure their children could attend to school and graduate. Every one can become OTA either individuals, communities, organizations, or corporations. Foster parents candidate could visit our office to make a donation directly. We will send our accountability report accordingly with your donation. Foster parents candidate could fill-in GNOTA Foster Parents Deposit Form in our official GNOTA website. Donation will be distribute in educational package to a foster child by their corresponding headmaster. Headmaster will consult the school committee and the village headman or local UPTD (Technical Implementation Unit) to discuss the required school supplies for the selected foster child. Donation of foster parents will be distribute by post office mail service (PT Pos Indonesia) to the selected headmaster, after that donation will be receive by the recommended foster child. Foster child recipient are oblige to sign the E2 Form to confirm the receivement of educational package. Signed E2 Form will be send to GNOTA office. GNOTA frequently documenting all donation and audited by a reputable accountant office. 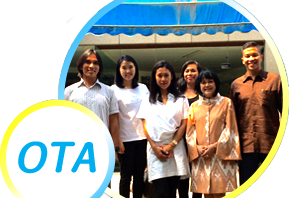 The National Movement for Foster Parents (GNOTA) is a non-profit, independent and transparent social organisation established on May 29, 1996. It is a national initiative by the community to safeguard children across Indonesia to receive the education they need as a solid foundation for a better future.